To conduct and record condition assessments of open-air rock art using CARE app format developed by Newcastle University and Queen’s University, Belfast. Assessment records are submitted to the CARE Project data centre at Newcastle University. The CARE condition assessment document is shown in Appendix 1. To add to and update data held on the ERA (England’s Rock Art) database. This complements the work done in the 2000’s by volunteers on the Northumberland and Durham Rock Art Project (NADRAP). Some members of our recording teams had participated in the NADRAP programme. To undertake photogrammetric imaging of selected stones and generate rotatable 3D models using Agisoft Photoscan software. 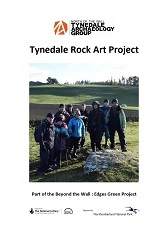 To compile a gazetteer of rock art sites in Tynedale. This is published as an accompanying document.